I'm so happy to have the bulk of #ProjectWalkway completed. I'm working on this project as part of The Home Depot's #HDBlogSquad so we were really motivated and excited to DIY it, but I'll be honest, laying that walkway was one of our toughest DIY projects ever. 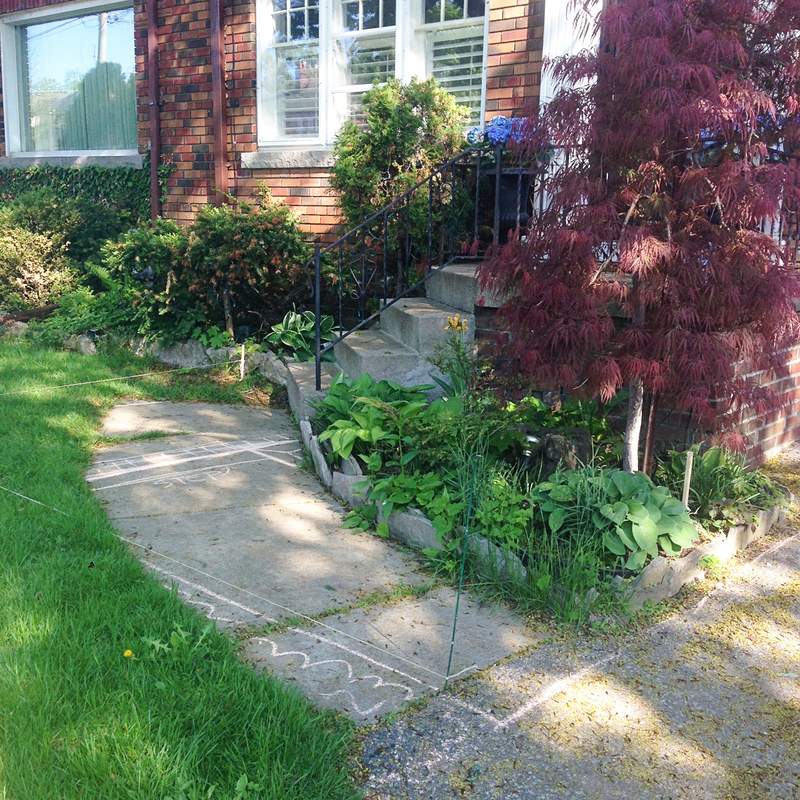 If our walkway were larger, I would have seriously considered hiring professionals to do the job. There's a reason landscape crews are usually comprised of several big & burly men - shovelling and moving all that dirt and stone is heavy work! 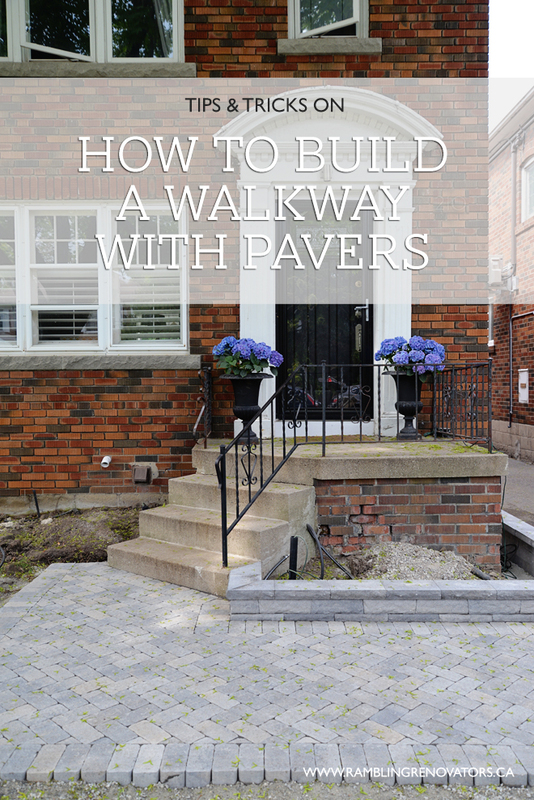 But if you're up for a DIY challenge, a walkway makeover really can transform your home's exterior. 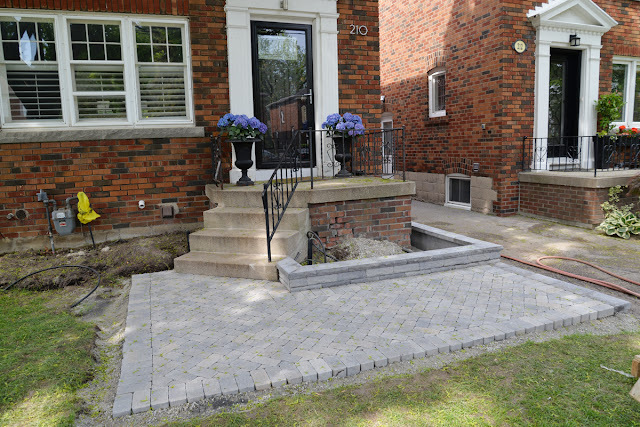 Here is a step-by-step and some of our personal tips in case you decide to tackle a small walkway or patio of your own. See the video summary here. 1. Mark out your new walkway area with chalk or spray paint. We laid out our plan with string lines a few days before we did any actual digging. This gave us a chance to see if we liked the size and scale of the new walkway and revise the plan if needed. 3. Remove the old walkway if one exists. 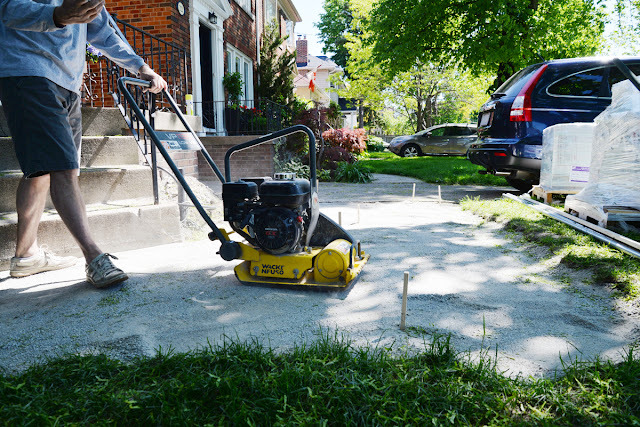 Tip: Instead of trying to randomly chip apart the old walkway, use the jackhammer to drill holes 2" apart. 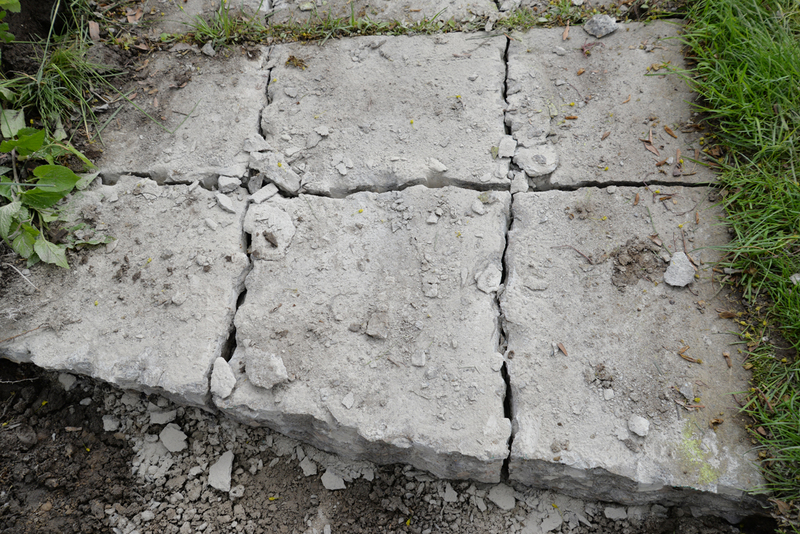 This will cause the concrete to crack along the holes naturally, leaving large blocks that are easier to remove. 4. 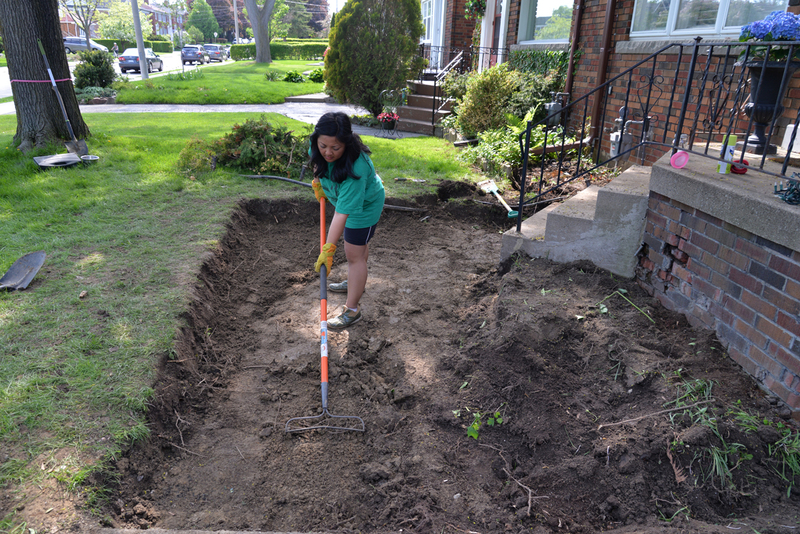 Dig down the entire walkway area 8" below ground. Remove the dirt and grass and level the soil. 5. 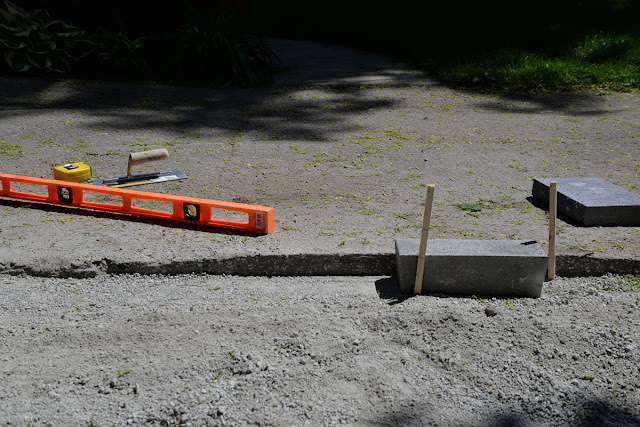 Insert stakes throughout the area to help with levelling. You will need to have 6" of gravel base below your pavers. Mark two lines on your stakes: the top of your paver and the top of the gravel base. Ensure your lines are level. 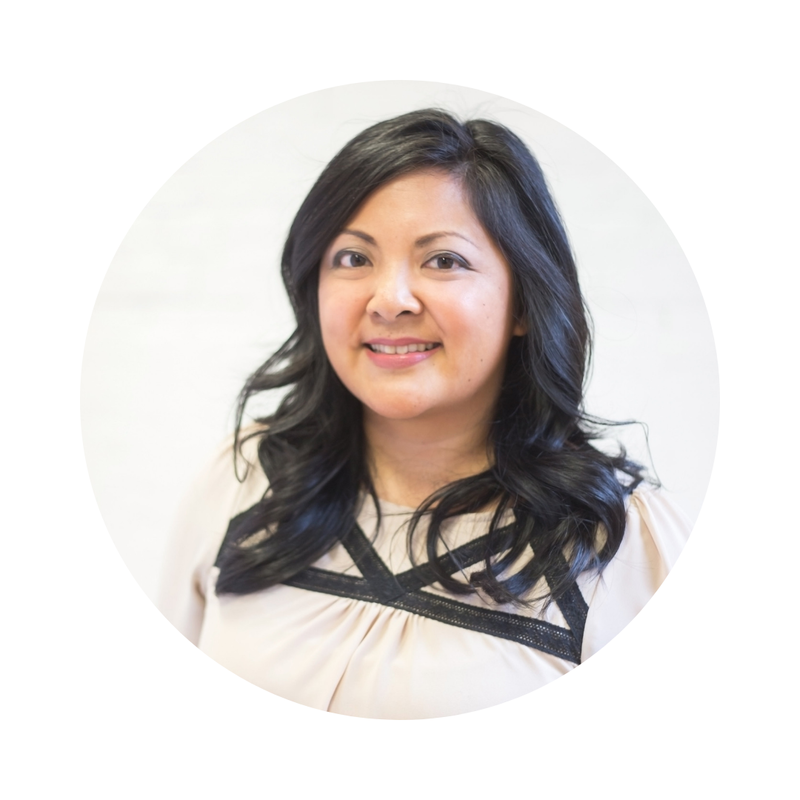 Tip: You can use a variety of materials for the base: gravel, high performance bedding, limestone screening. We used limestone screening which packs and compresses well. 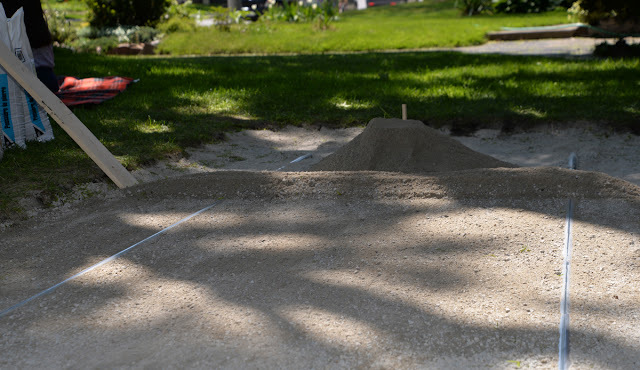 Lay 2" of limestone screening and tamp and level with a compacter. Repeat until you have laid roughly a 6" base, up to the bottom line on your stake. Tip: You will need to deal with changes in grade between your walkway and the surrounding ground. If there is a change in grade you can: build in a step, build a retaining wall, or gently slope your walkway up. In our situation, the grade at our steps was higher than the grade at our driveway so we built in a step at the driveway side. 6. Lay down a final levelling layer of sand and "screed" it. 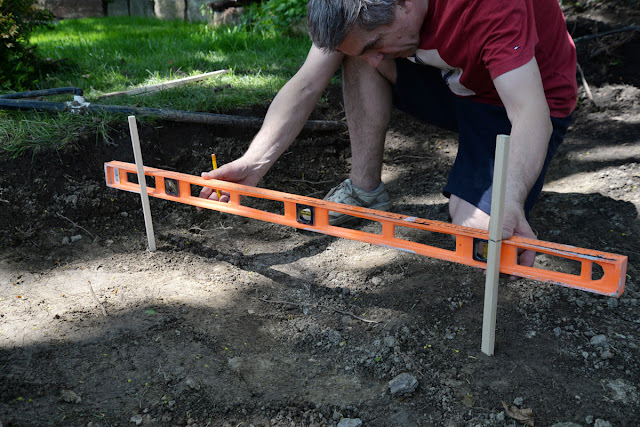 You can do this manually: use a piece of wood cut to the width of your walkway; place a level on top; drag the wood back and forth along the sand to screed and level it. Note that your walkway should have a gentle slope (1/8" per foot) away from your house or other structure to direct runoff away from the foundation and prevent pooling. Tip: Since our walkway was wide, we inserted two long poles (top rails for chain link fencing) to help with the screeding. Once we levelled the sand, we gently removed the poles and filled the gaps with limestone screening. 7. Now you are ready to lay the stone! Use string lines to keep your edges straight. Start with laying the border stones. Tamp stones down with a rubber mallet. Tip: Lay down all your full stones before doing your cuts. Some of your cuts will repeat so you can set up a guide on your wet saw and then do multiples of the same cut all at once. 8. After you have laid down all the stone, tamp it down one final time. 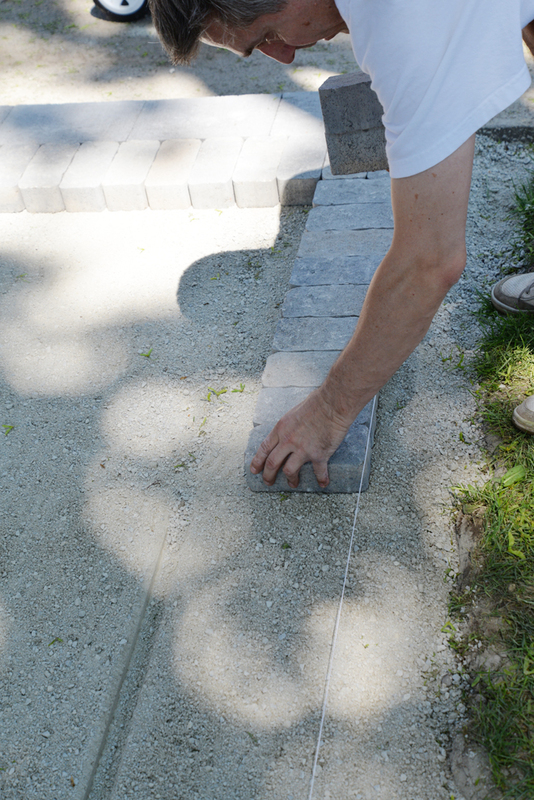 Apply polymeric sand to fill the 'grout' lines. This will help set the stones firmly. And, your walkway is done. In addition to the walkway, we laid a retaining wall around the garden. All in all, this took us about three days worth of work. We're halfway done with the full exterior makeover. A second wall still needs to be laid along the front of the house, the brick needs to be fixed, and we also need to put in the plants. The plan is to have a boxwood hedge along the outer edge of the walkway so a bit more digging needs to be done. 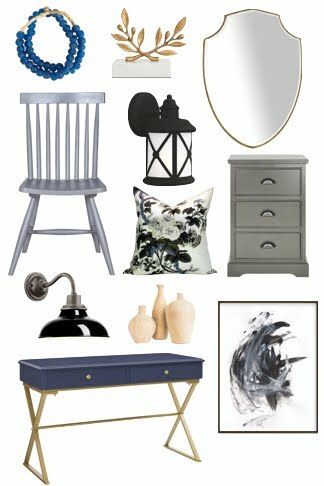 But things are looking really good so far. The only problem is the new walkway is making everything else look worse for wear - I think we'll have to clean the existing concrete steps, replace the railing, and freshen up the trim paint before we can call this done. Ah, scope creep! 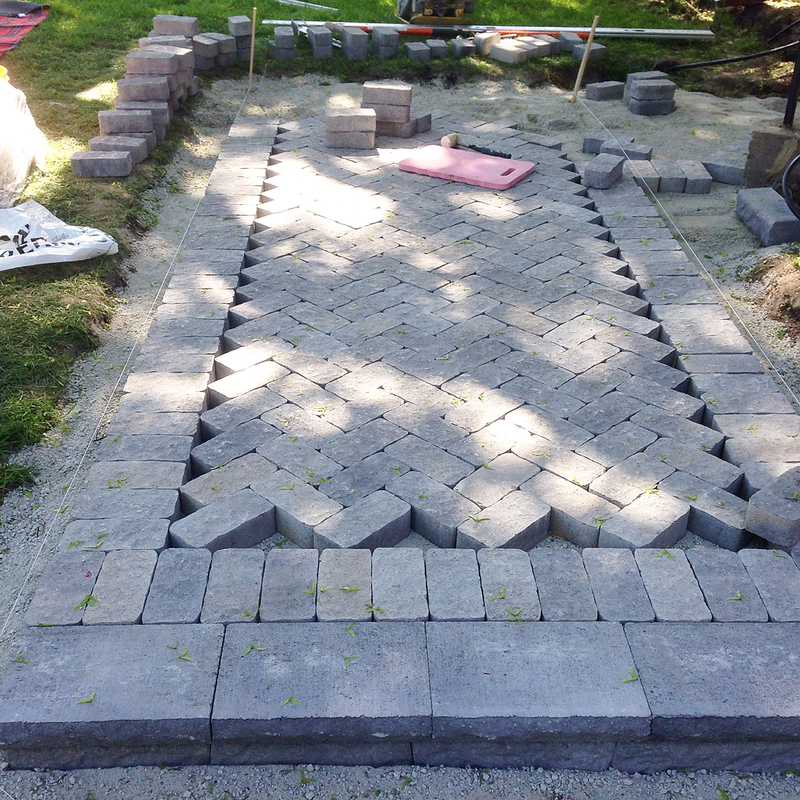 Are you tackling any outdoor projects this summer? 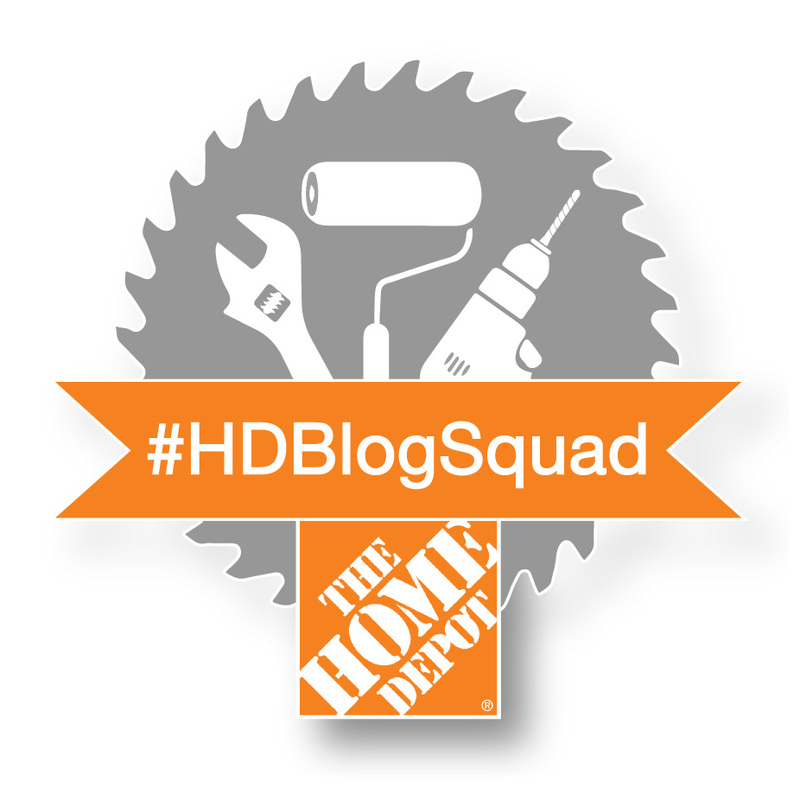 Disclosure: I completed this project as a member of The Home Depot #HDBlogSquad. Some materials have been provided for this project.